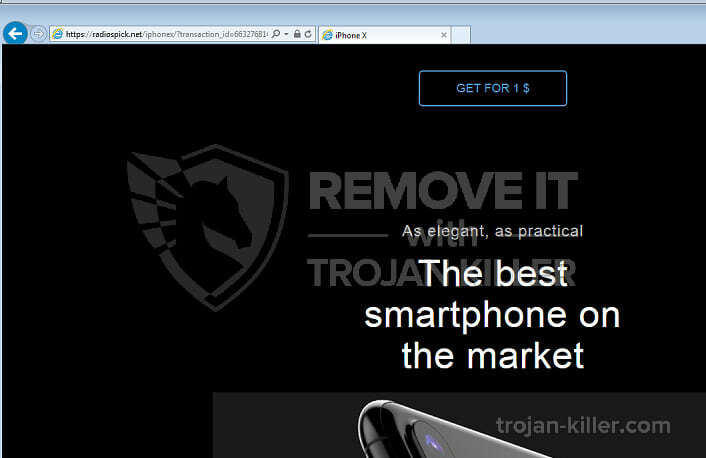 Home » How to remove » Adware » How to delete "The new iPhone X for $1" pop-ups? 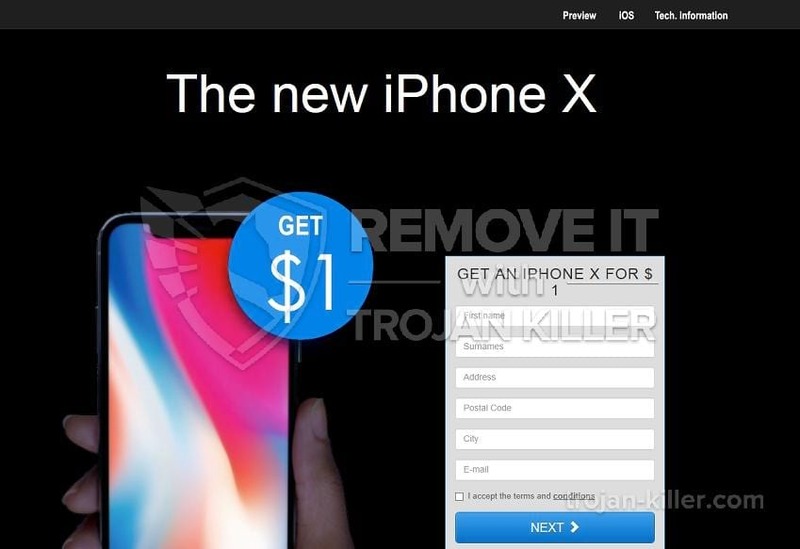 How to delete "The new iPhone X for $1" pop-ups? radiospick.net pop-ups tend to appear suddenly in your browser and propose to participate in a draw of a new iPhone. The only thing you need to do is answering several easy questions, as a rule, with obvious response options. Your browser starts showing you notification with indication of winning iPhone and asking to enter your personal details for receiving a prize. One of such details is your card number with the proviso that a small amount of money will be taken for transfer fees. Don’t be so fast to start iPhone chasing, otherwise, you are at risk to lose your sensitive information as “The new iPhone X” is going to send it to malicious users. Temptation to get the prize “The new iPhone X” pop-up suggests you is big, but don’t be fooled. This is nothing more than a lie to obtain your personal data. Cyber criminals prefer to use some exclusive items to encourage your interest. In real life, they only haunt your data. radiospick.net pop-ups are just a kind of these tricks. You should understand that presence of adware is a result of infection. The only way you can get rid of such alerts is deleting their source. Most of all radiospick.net pop-ups get to your system as a consequence of mindless downloading cost-free software. If you tend to reading installation requirements, that means you may accidentally download not only the program you wanted, but a bunch of unwanted adware, too. As usual, such useless things are attached to freeware programs. On the other hand, if your anti-malware tools don’t meet modern databases, that can provoke malware to appear on your computer. To make sure your software is reliable one, that doesn’t seem to be a bad thing. READ How to remove Mirthfulmeed.club? radiospick.net pop-ups can be removed by GridinSoft Anti-Malware anti-malware tool. Its built-in function allows you to scan your computer quickly, and find out if you have some other computer threat. Ut is also helpful in the reset your default browser. Have a look at the guidance below to facilitate the process of removal. Be free to ask about further support. BUT!! Unfortunately, it doesn’t mean that radiospick.net hasn’t installed some malicious software directly in your system. So, we strongly recommend every user, who has the same problem, to scan his computer after the browser resetting and make sure, that PC is clean and safe. Finally, this window is a proof of your system’s absolutely cleanness. You removed radiospick.net! STEP 3.How to prevent your PC from being reinfected with radiospick.net in the future.